One of the quickest ways to add the chicken pickin’ vibe to your country, rock, or jazz playing is to use muted notes. The idea is to add percussive ‘clucks’ to your line. We are going to take a look at 3 licks from Brent Mason and Brad Paisley that feature great muted note ideas. First, though, let’s talk about the technique involved here. I’m sure you’ve had times where you play muted notes on accident… but now we’re doing it on purpose! The key to this technique is to think rhythm first. You have to have a pretty clear idea of the rhythm that you are trying to play here before you start adding in muted notes. To actually play the muted notes, simply stop pressing the notes all the way down. You don’t have to change anything in your picking hand, just slight lift up with your fretting hand. The advantage of muting notes this way is that you will still get some of the note happening which helps to continue your line, but it will be muted enough to get the effect you’re going for. The first lick we’ll check out is from Brent Mason and is over an F chord. He is playing a scale line moving down to the fifth of the chord. He uses sixteenth note percussive sounds on the D string and the line on the B string. In this case think of it as 6ths. This is another Brent Mason lick. This time we have double stops and muted notes. The first part of this lick is almost a false start. He repeats that short phrase and then plays thirds double stops moving down the G mixolydian scale. The end of the lick uses the flat third to move down to the open G string. When using muted notes with double stops just mute one of the notes, not both. The last lick we’ll look at is from Brad Paisley and is in the key of E. This one uses the muted notes and a low string bend. Brad uses the muted notes by playing triplets which is another key ingredient with chicken pickin’. He highlights the root and then the fifth of the chord by using the triplet muted notes. 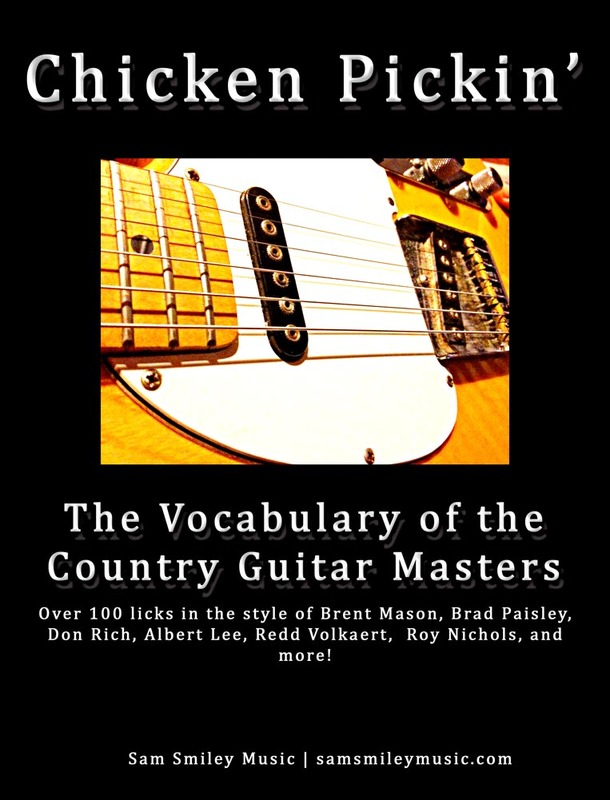 Make sure to check out my Chicken Pickin’ book for even more ways to add some chicken pickin’ into your playing.